For workers who have successfully completed Class 1. Workers at height move in rope access using PPE. They therefore carry out their work mostly in hanging position. Class 2 is further divided according to the specialization of worker or work group and by the place of work. This training is a good preparation for the IRATA Level I course in the field of OHS and PPE. 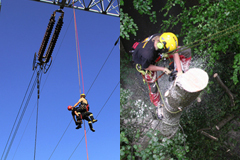 This training is a good preparation for the EUROPEAN TREE WORKER certification in the field of OHS and PPE.